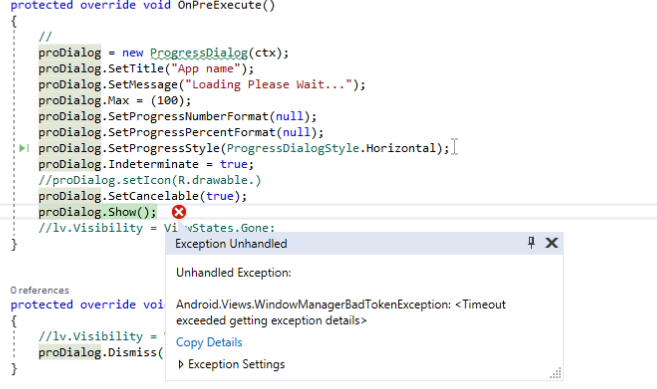 How to work with progress dialog in Android c# apps? How to work with progress dialog in Android c# apps? Here I am using below mentioned code but it is giving error while i am going to show ProgressDialog. Please be aware that ProgressDialog is deprecated in API 26, use ProgressBar instead ! Hello @ChristopheBERNARD , the solution you have provided is perfect. But I am facing another problem here. Which is completely different. The scenario is, I have a Master activity which is implementing "TabActivity" class. The master has TabWidget with 4 tab TabSpec. Then it calls first activity where this ProgressDialog is being fired and it is facing error "Android.Views.WindowManagerBadTokenException" how to resolve this? please help. ProgressDialog is working in any other pages. Hello @soumenhalder ...i don't know the best is to put a break point and see what happen's of course the object.Show make an exception but you nee do see if you context is present and on so .. I have found a similar question where the developer replace the progressDialog by an alertDialog .. I call it from my master activity. And it is working as expected. Thank you for the support.